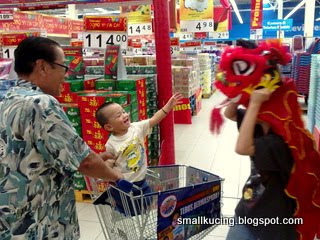 Three weeks ago I went shopping with Kong Kong and Ah Mah. Saw a red Lion. I wanted to pat it. And it came near to me. Then out of the sudden, the Lion JUMPED on my head and wanted to EAT me up. I screamed and cried. Kong Kong rescued me. On a brighter note, Mamarazzi saw thing Baju and had me put it on. I like it very much. Thus, Mamarazzi bought this for me. 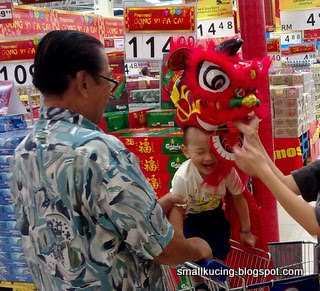 Mamarazzi said in this photo I looked like one of those "kedekut old man" that goes "kih kih kih kih" when counting $$. Sorry to give you a scared. Mamarazzi can be a bit "Kuah Cheong" sometimes. joshua looks like a miniature "boss" ...hehhe.. the last pic is very cute la!! really cute!! the last pics really look like Stephen Chow acting in one movie. That movie he always laugh "ek ek ek". He looked really cute in that outfit :-) We, too, were approached by a "lion' today. Surprisingly, C was not scared, and even took the mandarin orange that was offered through the mouth haha. I didn't cry coz Kong Kong and papa were there. Like Thong Shan Ah Pek :p...kekeke but on year once, hentam lor. 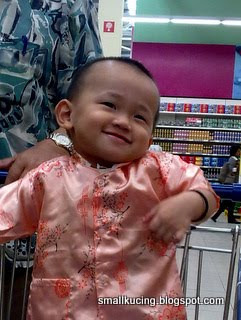 Your little Joshua boy looks so cute in his both tong san photos... love his cheeky smiles especially! 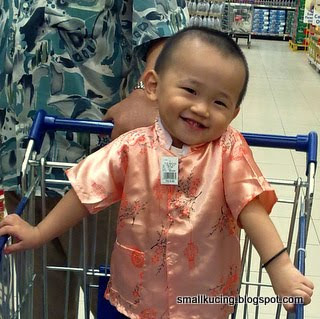 Oh, Joshua smiled so cutely when he pakai the CNY baju! 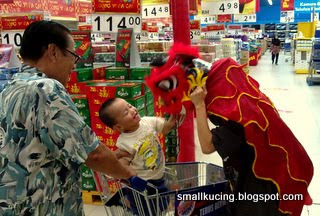 Juan Or ah, very scared of wearing CNY baju woh....will blog about it when it's nearer to CNY, hehhehe. I bought one was gold-based colour, then later his grandparents bought one white-based one, both also scared. the last photo is really funny! !